Cast: Bruce Willis, Garry Shandling, William Shatner, Eugene Levy, Steve Carell, Avril Lavigne, Nick Nolte, Thomas Haden Church, Omid Djalili, Wanda Sykes, Catherine O'Hara. Directed by Tim Johnson and Karey Kirkpatrick. Story: Woodland creatures nick food from a nearby housing estate. 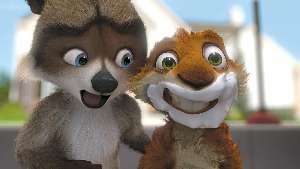 Over The Hedge is Dreamworks' latest animated adventure, adapted from the cartoon strip, and it's another hit. Sooner or later there's going to be an animated duffer, surely. It gets quite boring reporting on yet another beautifully made cartoony tale, but I have no choice - Over The Hedge is a very pleasant way to spend an hour and a half. Bruce Willis stars as RJ the world-wise raccoon who joins a motley band of woodland creatures who are knocked for six by the arrival of a new housing estate while they were peacefully hibernating. All the voices are typically good, including William Shatner as a possum with a penchant for playing dead, Eugene Levy as a cuddly hedgehog and the kiddie-pleasing tones of Avril Lavigne as William Shatner's possum daughter completing the eccentric casting. While there is nothing particularly new or special on show, the characters are nevertheless a joy to watch and are characterised marvellously, with Steve Carell's (40 Year Old Virgin) hyperactive little Hammy doubtless becoming a particular favourite with most viewers. By way of criticism, I can only say it's not quite in the league of the stupendous Madagascar, but it's sure as hell not far off. Over The Hedge is another in the increasingly long sequence of top-notch animated feature films. Take the kids, you won't be disappointed. To enjoy this film you should be: chirpy. Over The Hedge was released in the UK on 30th June. This is a good family film that has something for everyone, it's got the laugh-out-loud moments, it's got it's fluffy little creatures, it's got the enemy, it's got a few twists and unlike the majority of animated movies it actually says something, in a nice covert way, about our present consumerist society. In a nutshell "Over the Hedge" is a story about a raccoon (Bruce Willis) who gets a bears (Nick Nolte) food supply destroyed and is given a week to replace it all or become the food. Fortunately for our little friend he happens to come across suburbia and the remains of a wood where other little creatures are living. The resourceful raccoon cons these creatures into helping him get loads of food and eventually learn that you can't do 'life' alone you need friends and family. Saying any more is going to give the whole story away; the film is a blast and is well worth seeing.